On 2 June 2014, Metropolitan Hilarion of Volokolamsk, chairman of the Moscow Patriarchate’s Department for External Church Relations (DECR), arrived in Minsk with the blessing of His Holiness Patriarch Kirill of Moscow and All Russia to take part in the 4th European Orthodox-Catholic Forum. Metropolitan Hilarion is accompanied by hieromonk Stefan (Igumnov), DECR secretary for Inter-Christian Relations, and hierodeacon Nikolai (Ono). Upon his arrival in the capital of Belarus, Metropolitan Hilarion visited the Minsk Diocesan Administration and met with Metropolitan Pavel of Minsk and Slutsk, Patriarch Exarch of All Belarus. 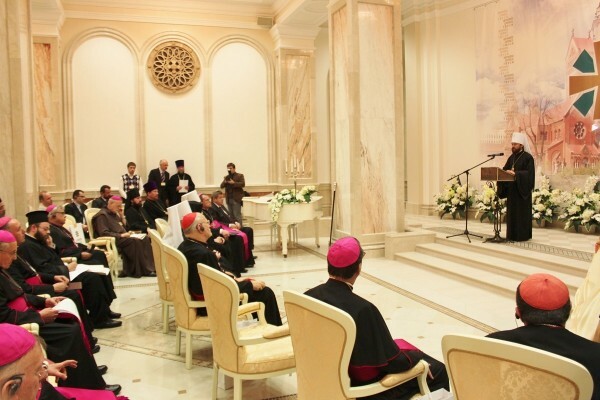 The 4th European Orthodox-Catholic Forum on ‘Religion and Cultural Pluralism: Challenges for the Christian Churches in Europe’ opened in the conference hall at the Memorial Church of All the Saints in Minsk in the evening of June 2. Taking part in the forum are bishops of the Orthodox and Catholic jurisdictions of Europe, clergymen and theologians. Mr. Leonid Guliako, envoy for religious affairs and nationalities of the Republic of Belarus, read out greetings from the Byelorussian President, Alexander Lukashenko. Metropolitan Philaret (Vakhromeyev), Honourary Exarch of All Belarus, greeted the delegates, noting the importance of the Orthodox-Catholic dialogue, and wished them fruitful work. Metropolitan Gennadios of Sassima (Ecumenical Patriarchate), co-chairmen of the Forum from the Orthodox side, read out greeting from Patriarch Bartholomew of Constantinople. Message from Cardinal Pietro Parolin, the Vatican’s Secretary of State, with greetings from His Holiness Pope Francis, was read out by Archbishop Claudio Gugerotti, Apostolic Nuncio to Belarus. Metropolitan Pavel of Minsk and Slutsk greeted the participants on behalf of the Russian Orthodox Church. He called the work for the preservation of moral evangelical values a major task of the present state of the Orthodox-Catholic cooperation. The fact of holding the dialogue in Belarus is symbolic, as Belarus has given a traditional example of inter-confessional peace and successful cooperation among representatives of different confessions. Addressing the participants also were Archbishop-Metropolitan Tadeusz Kondrusiewicz of Minsk and Mogilev; Bishop Alexander Kashkevich of Grodno, chairman of the Catholic Episcopal Conference of Belarus; and Cardinal Péter Erdö, Archbishop of Esztergom-Budapest, co-chairman of the forum from the Catholic side. He donated a particle of relics of St. Stephan, King of Hungary, to the Byelorussian Exarchate. The opening session was concluded by a concert performed by a male choir of the Memorial Church of All the Saints and by a reception given on behalf of the Byelorussian Exarchate. The European Orthodox-Catholic Forum was instituted in 2008 on the initiative of Cardinal Péter Erdö, Archbishop of Esztergom-Budapest, and Bishop Hilarion of Vienna and Austria (now Metropolitan of Volokolamsk and chairman of the Moscow Patriarchate’s Department for External Church Relations). Discussed at the three previous forums held in Trent, Rhodes and Lisbon, were the problems of the family, Church-state relations, and the economic crisis and poverty. The Forum will work till June 5.